Have you had Microblading but you are unhappy with the results and you want them removed? Perhaps you had a Microblading treatment abroad and they are uneven? Designing Faces are experts in all things Microblading, including semi permanent make up removal. 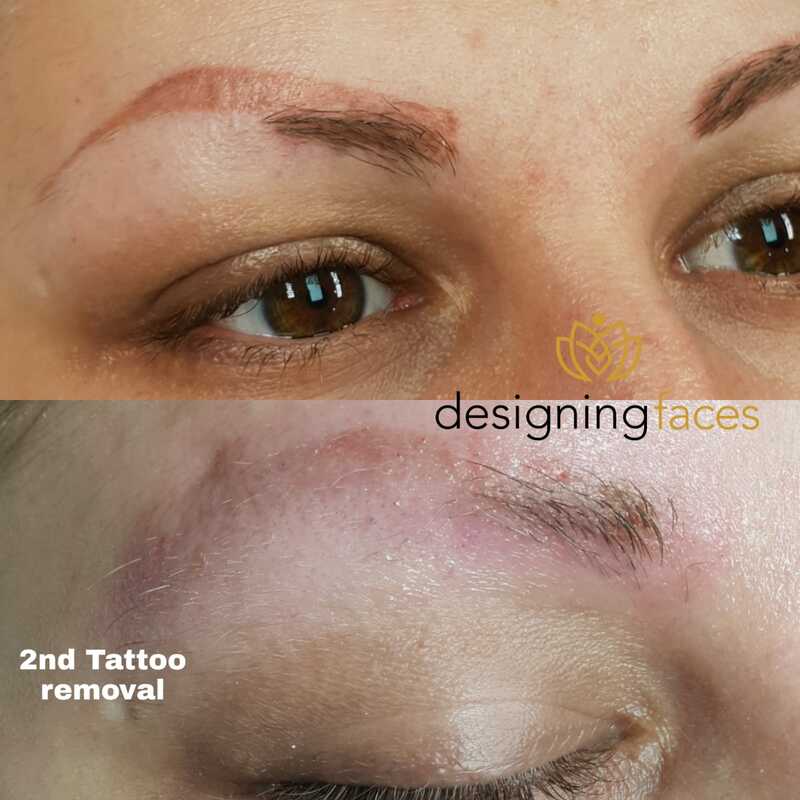 Designing Faces use the most up-to-date and most sophisticated German engineering for the safe and effective removal of microblading removal and tattoo removal. Our procedure is completely non-invasive with a basic PH, using tiny microneedles that hover of the skin (there is no penetration of the skin). Unlike other tattoo removal treatments, our therapy does not require the use of Lactic or Glycolic Acid, Chlorine (bleaching) or Saline. All of which can have unwanted side effects on the body. It also does not require dermabrasion or cryo (burning) of the skin. Our tattoo removal procedure is completely painless and any redness of the skin is short lived. The tattoo remover is applied in a similar manner to having a tattoo or micropigmentation applied using the same equipment. Results are achieved in 3-5 sessions rather than 5 or 6 as in the case of laser removal. 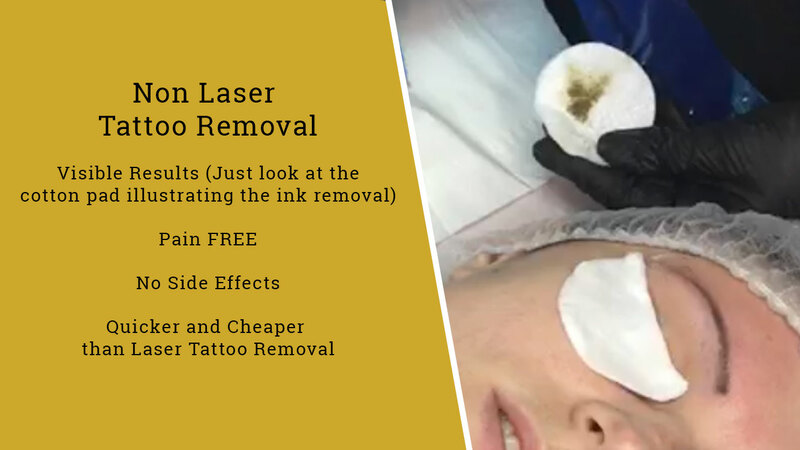 Can be used to completely remove either your body tattoos and semi-permanent cosmetics. Non Surgical and Non invasive so you can be worry free. No laser use, so you avoid scarring, redness or inflammation of skin. You will not experience bleaching or burning. Suitable for professional and amateur tattoos, regardless of ink pigment. Non colour selective, so it will remove all colours from your tattoo. Absolutely Low risk, there were greater risks having the tattoo in the first instance. 1. Please read our Frequently Asked Questions section below, which also outlines the cost of our Microblading removal treatment. 2. Then please call us on 0121 4444763 to book your first Tattoo / Microblading removal treatment. Or use the online form and we will contact you. 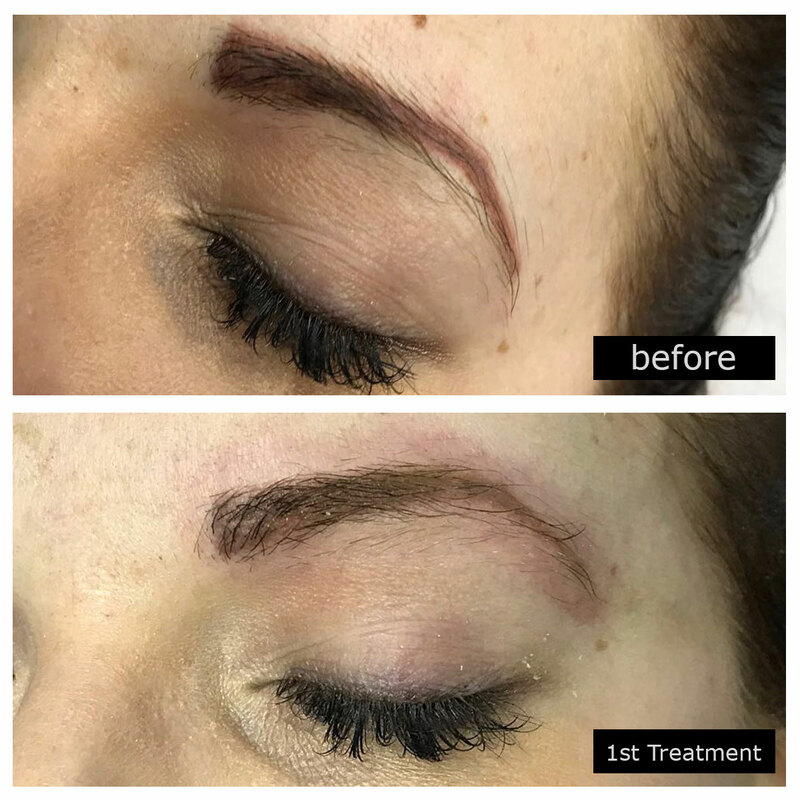 Microblading is a great semi permanent make up treatment, but if you choose the wrong provider, it can go horribly wrong. 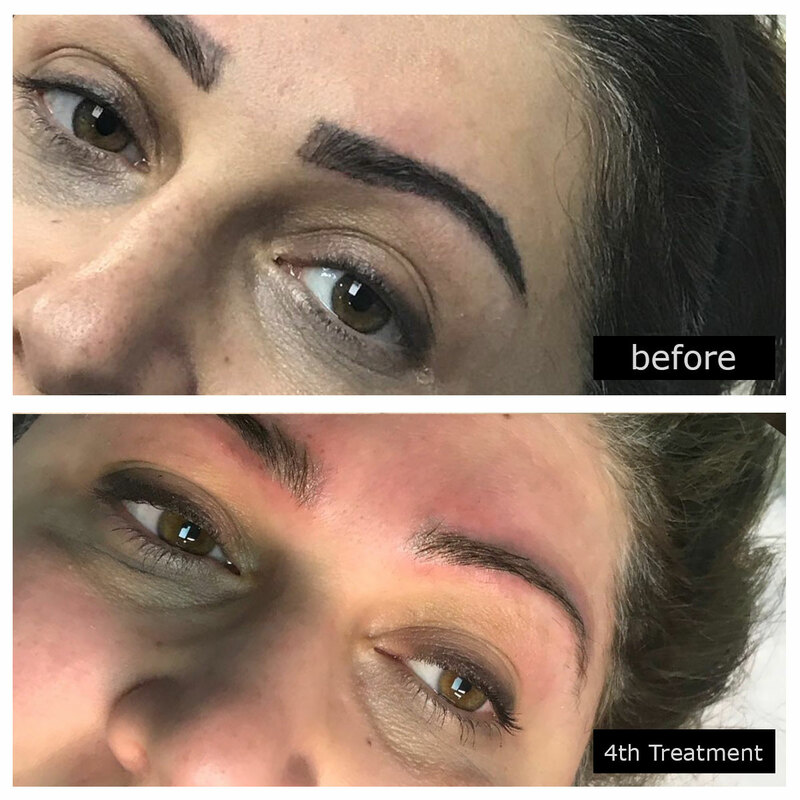 Below are some images of clients whom have come to us for Tattoo / Microblading removal after having a terrible experience elsewhere. Non Laser Tattoo / Microblading Removal £200.00 for 1st treatment, then £120 per treatment thereafter. The procedure is completely pain free. The technology we use involves the use of magnetic needles that skim the surface of the skin to create slight friction. We have a very high success rate of removal. This includes 100% for permanent cosmetic tattooing and 92% for body tattoo removal. Body tattoo success will depend on your skin type and the fact that every tattoo is different, that is why complete removal cannot be guaranteed in every case. A treatment takes around 45 to 60 minutes to cover a 2×2 inch square area 5x5cm2. I have unwanted semi permanent eyebrows, will this remove this kind of tattoo? Yes, this treatment will remove 100% of semi permanent make up. On average most tattoos can be removed in 3-5 treatments depending on the size, type and location of the tattoo. How frequently can I have the treatment? Treatments can be carried 2-3 weeks from the initial treatment for most of the crusting to fall away, normally after around eight to twelve weeks the area is healed sufficiently for further treatment. You may also take breaks in the treatment as this will not affect the outcome. 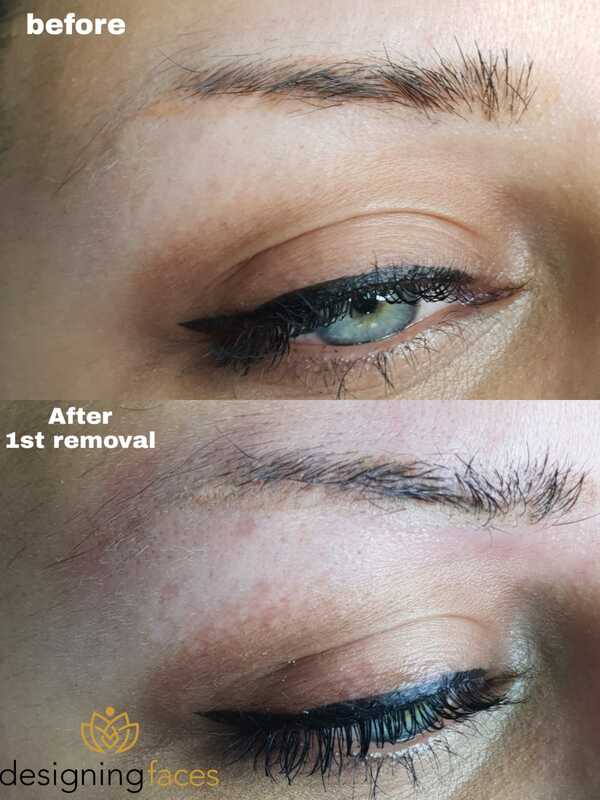 This treatment is very effective at removing body tattoos and permanent makeup. The protective crust that forms over the treated area will have absorbed most, if not all, of the tattoo ink. Once this crust is shed from the skin, so too will the unwanted tattoo ink. Your tattoo can be completely removed in just a matter of months, compared to years with a standard laser treatment regime. It is important that you do not consume alcohol before your treatment as this can affect the blood clotting process. We recommend that you eat well before treatment as blood sugar levels can drop during the treatment process and lead to you feeling symptoms of dizziness and nausea. Do not rub or scratch the skin with your fingers, pencil or makeup brushes. We recommend you avoid wearing clothes that might scratch the treated area. Do not use a sauna, swimming or playing sports (avoid sweat) is allowed on the first day. You may smoke after 30 minutes following your tattoo removal session (Lips removal). Please avoid applying any foundation, powder makeup, hydrating creams, sunscreen, pencil, etc. on the treated area for at least 1 week. 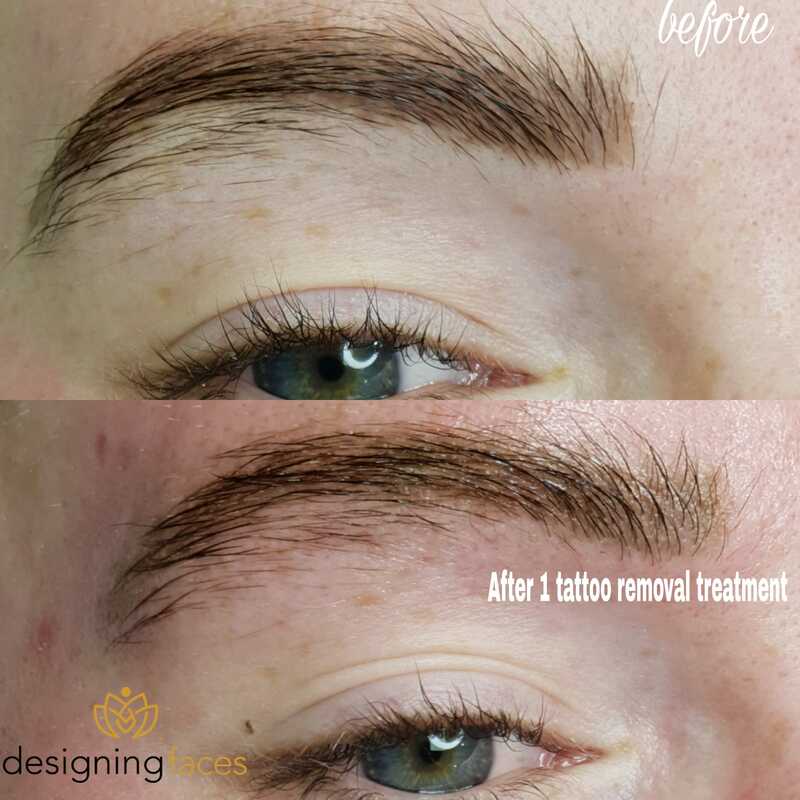 The treated area can be re-pigmented after a good recovery period of at least 3 months for lips and eyebrows permanent make up, and usually up to 6 months for body tattoo removal. However, the skin recovery process might be different from person to person. If any unexpected problems arise during the healing process of your skin even after you have followed all the aftercare instructions, we recommend you seek medical attention or call 112 immediately. As soon as your skin is healed you can return for another tattoo removal session. HYGIENE: the treated area needs to be clean at all times. Clean the treated area with water and natural soap (baby soap) when necessary.